Happy Birthday Wishes, Happy Birthday Quotes, Messages, Greetings, Verses and Poems for a child's birthday card. Birthday quotes, birthday poems, funny birthday wishes for kids, birthday sayings and verses that are useful when writing a message or a happy birthday greeting in a children’s birthday card. 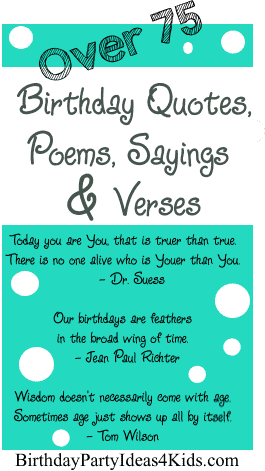 We’ve listed our favorite birthday funny quotes, poems and cute birthday wishes for kids and children’s birthday’s and kids, tweens / preteens, teenage and adult birthday cards. The perfect birthday quote for family and birthday wishes for a friend. Wish them Happy Birthday greetings with these fun sayings and verses! Belated Happy Birthday wishes are located at the bottom of this page. You are you. Now isn't that pleasant? Very good advice. You go now. Always be ready for happiness. If we didn’t have birthdays, you wouldn’t be you. Or worse than all that… Why, you might be a WASN’T! But you… You ARE YOU! And, now isn’t that pleasant! And in the end, it's not the years in your life that count. "When I was younger, I could remember anything, whether it happened or not." Oh, me thinks you can think up if only you try. And now,” cried Max, let the wild rumpus start! Where you love somebody a whole lot, and you know that person loves you, that’s the most beautiful place in the world. You just think lovely wonderful thoughts, Peter explained, “and they lift you up in the air. Don't do anything embarrassing on your birthday this year. You don't have as much time to live it down as you used to. But now I'm six, and clever as clever. So I think I'll be six, forever and ever. Make a fun anagram out of the birthday child’s name. Use one descriptive word for every letter. May your birthday dreams and wishes come true. A year older and a year better. Here's to one more year of experience. Wishing you great happiness and a joy that never ends. Hope your birthday blossoms into dreams come true! Because you're you, I'm celebrating today! Remember, you'll be ____ (insert age of child) for only one year but you'll be awesome forever. Hope your day is as special as you are. May your birthday be as magnificent! Growing old is mandatory... Growing up is optional! And now my song is through. May today be filled with all the things you wished for. I didn't forget your birthday, I'm just fashionably late. I may have forgotten your birthday, but I didn't forget about you! Don't hate me because I forgot your birthday. Hate me because I'm beautiful. I didn't forget about your birthday; I just wanted to help prolong the celebration. I didn't really forget your special day, I just figured you deserved more than one. Fashionably late. Hope it was great. I may have forgotten your birthday, but at least I remember that I forgot your birthday. 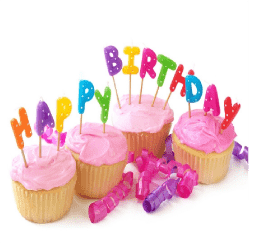 We hope you've enjoyed these funny birthday quotes, birthday poems, happy birthday wishes, birthday sayings, happy birthday messages, happy birthday greetings and birthday verses for kids, tween, teenager and adult birthday cards. If you have a favorite birthday quote, poem, wish, saying or verse that you would like to add to our list please contact us!